The UG Tube Socks have arrived. These 24" soft poly-cotton blend socks are ribbed and ruched for a snug fit that cradles your foot during athletic duress. 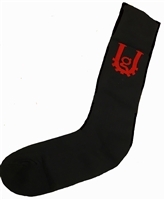 Black with the classic UG logo in red on each outer side, these are a perfect accompaniment to UG apparel & gear. The sock is one size and fits like a tube sock on larger feet & calves, while smaller feet can also wear as a knee high.